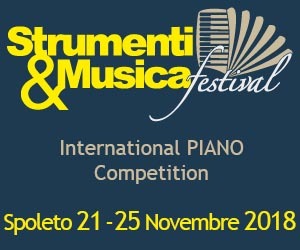 Stop registrations to 6° International Piano Competition “Città di Spoleto” (21st-25th November 2018) … The Artistic Director M° Michele Rossetti formalises the timetable of competitors for this edition who will involve numerous participants from different countries. Wednesday morning, 21th November it will start a real “tour de force” until to Sunday afternoon, 25th November, final day which is to culminate with the concert of the winners all categories in the amazing theatre Caio Melisso. To be followed the performance of the “TRIO DEL MISTERIO” of the accordionist / bandoneonists Marco Gemelli which will close this 10° Edition of Strumenti&Musica Festival.